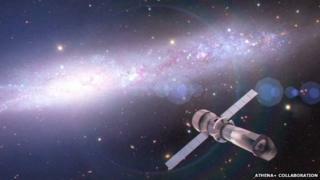 Europe has initiated the process that should lead to the biggest X-ray space telescope ever built. Dubbed Athena, the satellite will be some 12m in length and weigh about five tonnes when launched in 2028. The European Space Agency's (Esa) Science Programme Committee selected the project at a meeting in Toulouse. Design work now will confirm the technologies and industrial capability needed to construct the mission, which is costed at over one billion euros. "It's a tremendously exciting moment for the team; it's not every day you have a billion-euro decision go in your favour," said Prof Paul Nandra, the chairman of the Athena Coordination Group. "We've just got to build it and get it up there, and as long as we do our job right, there's nothing that should stop that," he told BBC News. The SPC will meet again, probably in 2019, to give a full and final approval to the telescope project. This should be a rubber stamping exercise - provided costs can be contained and no technical showstoppers are identified. In truth, there should be no surprises. The Athena concept has been under study for a number of years already by leading scientists and industrial partners. Athena is regarded as a next-generation observatory - an X-ray equivalent to the giant machines such as the Square Kilometre Array and the European Extremely Large Telescope that will view the cosmos at longer wavelengths. Athena will have a survey capability and sensitivity a hundred times better than today's best X-ray space telescopes - America's Chandra mission, and Esa's XMM-Newton telescope. Athena will use its advanced optics and detectors to look deep into the Universe and far back in time. The key objectives are twofold - to understand how gas was assembled into the galaxies and galactic clusters we see around us today, and to study the origin and evolution of the monstrous black holes that reside at the centres of galaxies. An Athena-like telescope is needed to do this because the processes being investigated are extremely hot, and radiate at high energies - in the X-ray portion of the electromagnetic spectrum. The telescope will carry some novel mirrors for the purpose, incorporating "silicon pore optics". These use stacks of silicon material to corral the X-ray photons towards the telescope's two big instruments. "The Wide Field Imager does what it says - it maps X-rays over a wide field, and that's what you need to discover black holes in the distant cosmos, to count them, and to see how they formed in the early Universe when the first stars and galaxies were also forming," explained Prof Nandra, who is affiliated to the Max Planck Institute for Extraterrestrial Physics in Garching, Germany. "The X-ray Integral Field Unit will do spectroscopy, measuring very accurately the energy of the X-ray photons. The XIFU enables you to do lots of very interesting astrophysics, mostly regarding hot gas structures in the Universe." One interesting question for the forthcoming design study concerns Athena's launcher. Ordinarily, the choice would be a heavy-lifting Ariane 5, but there is no certainty that this rocket will still be in production by 2028. Europe would hope by then to have a new vehicle, Ariane 6. However, its specifications are currently under review and the ability to loft a telescope the size of Athena has yet to be confirmed. Athena is what Esa terms a "Large Class" mission - its biggest and most expensive space science ventures. It likes to launch one of these every few years. Gaia, a star mapper, has just gone into orbit. This will be followed in 2016 by BepiColombo, a joint project with Japan to go study the planet Mercury. Juice, a mission to Jupiter and its moons, is taking the 2022 launch opportunity. And with Athena targeted for 2028, it is likely the 2034 slot will go to a trio of satellites known as Lisa, which will aim to detect gravitational waves in space.